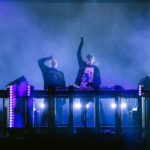 Up and coming producers Midnight Kids have released their take on Gryffin and Illenium‘s hit “Feel Good.” Midnight Kids’ heartening progressive house remix slows down the original track and adds layers of uplifting, complex synths to the drop. The duo’s creative take on the piece showcases their developing artistry; with each release, Midnight Kids are cultivating a distinct provocative style that is primed to soon be widely recognizable. The potential displayed in Midnight Kids’ remix of “Feel Good” proves the group to be among 2017’s most promising acts.